Going to the Detroit Auto Show next week? You can't just ride around in any old car. You've gotta cruise in proper American style! That's why Cadillac is teaming up with taxi app Uber to provide free rides around the city in an Escalade. No, it's not the shiny new 2015 Escalade. It's the 2014 model, but that's still pretty fancy, right? 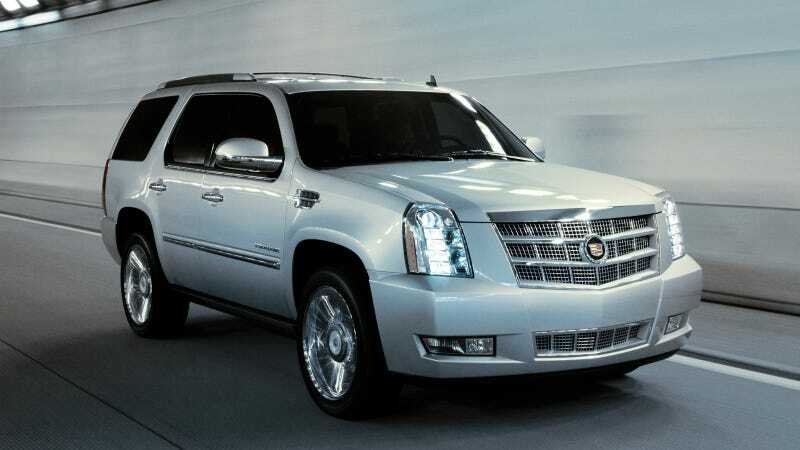 The rides will also be provided in Cadillac's smaller SUV, the SRX. You can get an Uber ride for up to 15 minutes to all destinations within Downtown, Corktown and Midtown, free of charge. The offer starts on Sunday evening and runs through 1 a.m. Saturday. To request a ride in a 2014 Cadillac, users should open the Uber smartphone app, toggle to the right and select the "Cadillac" option; select the pickup location; tap "Request;" and the 2014 SRX or Escalade will be on its way. Riders are encouraged to post to Twitter and Instagram about their experiences using the #UberCadillac hashtag to @Cadillac and @Uber_Det. Meanwhile, your Jalopnik staff has a Ford Raptor while we're in town. We aren't teaming up with Uber to give you free rides around town, but we will do smoky truck burnouts on demand.